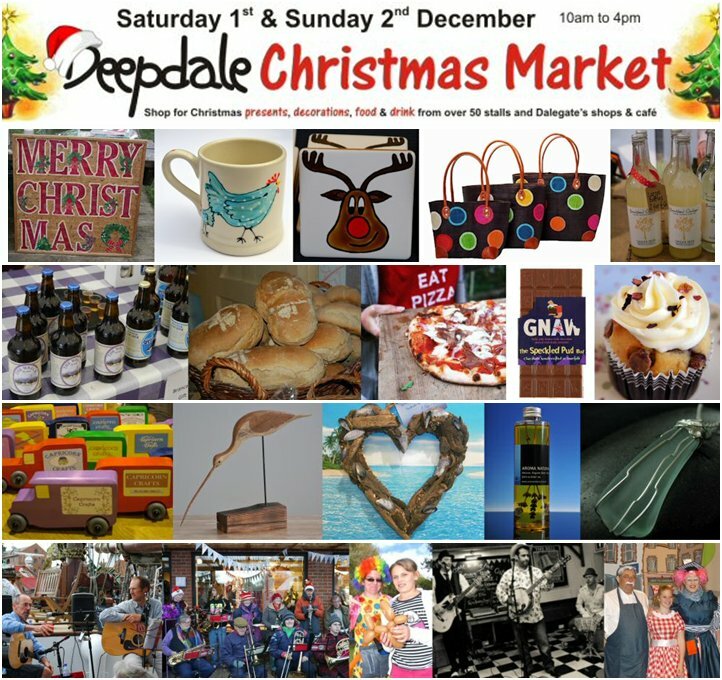 On Saturday 1st & Sunday 2nd December, Dalegate Market plays host to over 60 stalls and shops at the Deepdale Christmas Market. You can’t have a better way to start the Festive Season or a better excuse for a Winter visit to the beautiful North Norfolk Coast! “We are welcoming a great mix of decoration, present, food and drink stalls for this years Market. There are some of our favourites returning and many new stalls too for the biggest Christmas Market we’ve ever held.” said Jason Borthwick, one of the organisers of Deepdale Christmas Market. This will be the fourth annual Deepdale Christmas Market and like previous years, entrance is FREE to visitors. You are welcome to browse the stalls in three large marquees around Dalegate Market, enjoy some great entertainment and lots of lovely food & drink. Deepdale Café, our permanent café which is open all year, the Proper Pizza Co and Honey’s Mobile Caffe will be supplying lots of yummy stuff to keep you warm while you enjoy the Market. There’ll also be food & drink from Brancaster Brewery, Brays Cottage, Handmade & Heavenly, The Chocolate Deli, Breckland Orchard, Denver Windmill, Ebenezer Cottage, Gnaw Chocolate, Pecans, Anna’s Hand Made Fudge, Honeysuckle Cakes, Lymn Bank Farm Cheese, Philli Chillies, The General Store and The Norfolk Brewhouse - You definitely won’t go hungry! If you are looking for presents, you won’t be short of options. The Dalegate Market permanent shops can offer a range of clothing, outdoors equipment, jewellery, accessories, art and craft items – Fat Face, Gone Crabbing, Relish, One Stop Nature Shop, The Hare & The Hen and Keshco's. Then there are an abundance of stalls offering books, beauty products, jewellery, furniture, coastal items, artwork, stained glass, treasure trails, bags, cards, kitchenware, photography, toys … We doubt you’ll need to look any further for all your present ideas? While you are getting some retail therapy and starting the festive season, we have entertainment for you. On Saturday The Quaysiders will be playing in the morning and in the afternoon we have our annual Christmas carols session with the Hunstanton Concert Band and the St Mary’s Carollers. Carol sheets will be available and you are most welcome to join in. On Sunday morning The Misfit Collective will be playing in the morning and we’ll be joined by cast members of the Hunstanton Pantomime in the afternoon. Charlene the Clown will be wandering around the site creating balloon models and performing circus skills throughout the weekend. All the shops, stalls and café will be welcoming visitors from 10am on Saturday 1st December. Why not use the Deepdale Christmas Market as a perfect excuse for a Winter visit to the beautiful North Norfolk Coast!